Just as insulin resistance causes diabetes later in life, Growth Hormone resistance causes premature aging. Growth Hormone resistance (your body resisting the benefits of Growth Hormone) is caused by rising levels of the "anti-Growth Hormone substance", Somatostatin (SomaTOstatin) which increases as you age. And, unlike insulin resistance, Growth Hormone resistance affects everyone as they get older. Now, there's a solution, and its called SOMASTATIN, the anti-HGH antidote. SOMASTATIN comes mixed in a two-part formula, the first part containing specially developed GH and IGF-1 peptides, and the second an anti-Somatostatin called RETROSTATIN (a powerful suppresser of the antagonistic hormone, Somatostatin, responsible for what is called the negative feedback loop for GH). No matter what form of GH product or injections you use, SOMASTATIN makes it much more powerful. When using a GH supplement, such as our AEON, this allows you to use approximately twenty-five percent less SOMASTATIN. This process is called "potentiation" or "synergy." *We recommend using AEON, Somastatin and Amino Rx together! Have you made clinical studies of Somastatin? 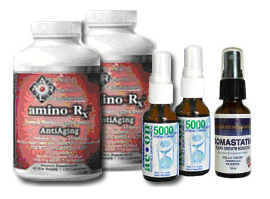 Yes, we have clinical studies as well as an extraordinary staff and many years of customer feedback. Please click on the link below and you can review the clinical studies about SOMASTATIN our growth hormone potentiator and somatostatin inhibitor. The "ANTI-ANTI" growth hormone. View the final results of the Somastatin clinical study. Witness the candid experiences of the volunteers discussing pain, hair growth and color, blood pressure, cholesterol, sleep and much more here. View the forensic analysis of gray hair returning to the color of black from David M. Sugiyama, a criminalist for the Los Angeles Police Dept. as a result of using SOMASTATIN. These studies and their clinical results are very significant for all of us.